PROFAUNA Borneo went on an educational visit about sea turtle conservation at MAN (Islamic High School) Berau last Friday (21/7/2017). During the visit, PROFAUNA's activists talked about the importance of sea turtle for life. In front of 25 10th grade students, PROFAUNA explained the irreplaceable role of sea turtles in maintaining the health of ocean ecosystem. Sea turtles eat polyps in coral reefs, so that coral reefs could grow well. Healthy coral reefs will become invaluable resource for the ocean biota, including the fishes. The students followed the explanation enthusiastically, especially the part about how sea turtles, the ocean, and human life are connected. They finally understand why they have to protect sea turtles. "Lack of knowledge and understanding among young people about sea turtle conservation makes it a common thing to wear accessories made from Hawksbill Turtle's shell," said Bayu Sandi, PROFAUNA's campaign officer. 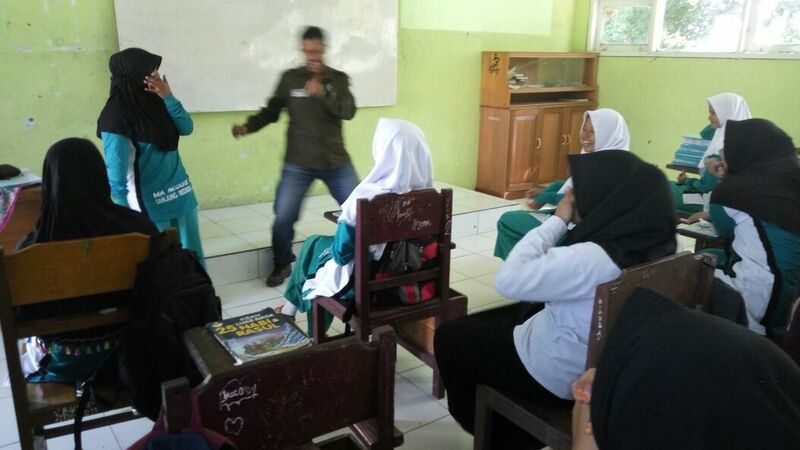 The principal, Ali Muttaqin Syuryanto, who has been proactively promoting environmental issues in his school, added "We strongly support environmental education activities, and we would be glad to host PROFAUNA anytime to raise our students' awareness towards sea turtle protection." The waters of Berau is world-famous as an important habitat of the Green Turtle (Chelonia mydas) and Hawksbill Turtle (Eretmochelys imbricata). However, local people's awareness towards sea turtle conservation is still low, mostly because they do not understand why they have to protect sea turtles. "PROFAUNA Borneo's team is preparing a field training program for young people about sea turtle conservation. The topics will range from sea turtle trade monitoring up to sea turtle nest rescue," claimed Bayu Sandi.